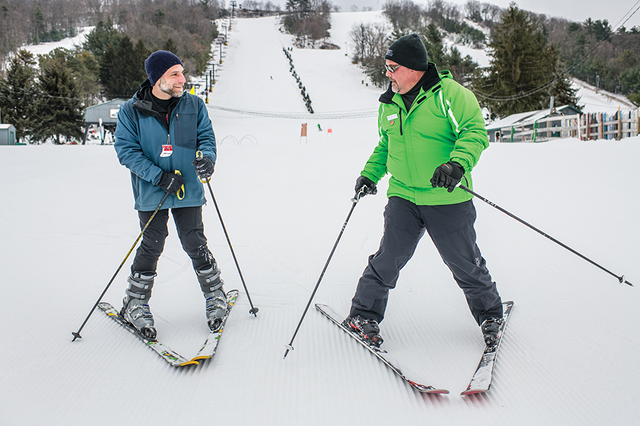 Writer Vince Corso (left) with instructor Reed Mellinger at Tussey Mountain. After all, it looks like so much fun, sliding down the slopes, weaving in and out and building up speed as you go. I’ve wanted to give it a shot, but growing up in flat Wisconsin, skiing wasn’t something that was easily accessible. My family wasn’t the type to go on skiing vacations, so I never had my chance at it. When I moved to Denver and then later State College, I fell in love with the mountains, hiking them and climbing them whenever possible, but skiing seemed intimidating. But I wanted the thrill, I craved the rush, so I decided that before I turn 40 next year I was going to at least give it a try. But I needed someone to help me learn how to do it. So with some trepidation, I put on my cold weather gear and headed up to Tussey Mountain Fun Center and put my trust in instructor Reed Mellinger to help me learn how to slide down a hill on two long pieces of plastic. I was as nervous as I was excited. When I got all my rental gear from the lodge, I looked up at the steep hills with awe and wonder at the people gracefully maneuvering down the slope in and out. I could barely walk in my ski boots, and the thought of maneuvering on skis seemed daunting. Luckily Reed knew what he was doing, because I certainly did not. I didn’t even get my boots strapped on correctly before the lesson, but Reed was there to help with that, strapping me in nice and tight. Reed started my lesson without skis, just focusing on how the feet and body should move going downhill. He wanted me to lean into the front of the boot by moving forward with my ankle. I kept leaning forward at the waist, but eventually got the idea. Then we put on one ski at a time and practiced turning in a figure eight while gliding the ski on the snow. This was more difficult than I would have thought, because the body is not used to moving in this way. I got a little out of control at times, but was able to reign it in. Reed was patient throughout, which is no wonder, as he has spent a career in the public education system, having just retired last year after 25 years as a principal in the Jersey Shore School District. He has skied for 50 years and instructed skiing on and off at Tussey since the 1980s. Through the years he has skied some pretty impressive slopes in the states and Europe. 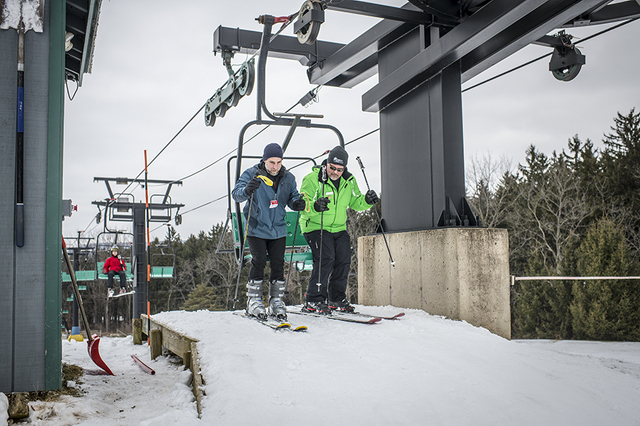 He is in his element at Tussey, living his two passions, skiing and teaching. After spending some time focusing on how to slow down and stopping by turning the skis into a wedge, Reed was ready to let me try the bunny hill. At first, I felt a little silly on the small hill. I had driven past it many times on the way to hiking excursions in Rothrock State Forrest and I always thought, “How difficult could that be, going down such a little slope?” Then I started going down and I realized that it was much harder than I imagined. We were working on stopping as we were going downhill and I wiped out after losing my balance on the first run. My hands and arms were flying everywhere as I tried to regain my balance, but I couldn’t get back in control. I didn’t hurt anything but my ego, but I knew that it would take a few falls to learn how to do this. I wasn’t giving up and neither was Reed. After helping me learn to get myself back upright without sliding down the hill out of control again, Reed gave me the pointers I needed. “Always lean forward, look ahead and not down at the skis” and “put your hands more out in front of you.” The tips helped. Later I wiped out again one more time as we worked on controlling our speed down the hill, but I was starting to feel more comfortable after each time down. Reed was helpful in teaching me how to navigate the lift back up the hill and all the other things that might seem a little overwhelming for a newcomer. Eventually we were ready to work on turning. The focus was to use the feet and not the body. I fell over on the first go-round, but I was used to that by now and wasn’t going to let it stop me. Finally, I was able to make it down the hill with controlled weaving back and forth. After the third time of doing this I was really starting to get comfortable. I could understand how the skis would respond with certain movements and was able to build some speed and then rein it back in when needed. It was awesome. I was skiing. It was on the bunny hill, but I was getting it. When I picked up speed there was a rush of wind and the swish of the skis gliding on the snow. It was intoxicating. Soon enough the lesson was over and Reed seemed pretty happy with the progress I made. He said after some more time on the smaller hill, I would be able to make my way up to the higher slopes. I felt pretty sure that that was true. I spent another half hour on the hill alone working on my turns and got more confident as I went along. Sitting on the lift, by myself, looking out over the mountains, I realized that I had been missing something special all these years, a kind of exhilarating magic fun that is right there for you to try. I will be back out again soon to conquer that bunny hill and then move on to higher and longer trails. Thanks for your help Reed, you have taught me something pretty special.